Augsburg - Newly-promoted SV Darmstadt 98 remain unbeaten away from home this season, and will hope to add FC Augsburg to their impressive list of successes so far (kick-off Saturday 15:30 CEST/13:30 GMT). 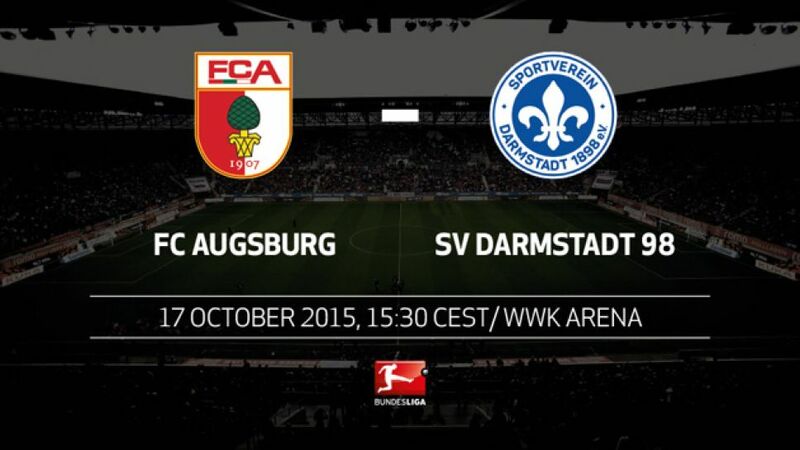 This is the first time that Augsburg and Darmstadt have played each other in the Bundesliga. Darmstadt remain unbeaten after three away games, despite having travelled to sides competing in European competition. Dirk Schuster's side drew at FC Schalke 04 (1-1), won in Leverkusen (0-1) and then snatched a point with a last-minute leveller in Dortmund (2-2).Augsburg have already suffered three home defeats this season - they lost just four times at the WWK ARENA in the whole 2014/15 campaign.Markus Weinzierl's side are, however, unbeaten in their last 12 competitive meetings with Darmstadt.Darmstadt's Konstantin Rausch has scored three of his 12 Bundesliga goals against Augsburg, more than against any other side.Dominik Stroh-Engel has scored all 18 penalties he has taken as a professional.Sandro Wagner stepped up for the late spot-kick against 1. FSV Mainz 05 last time out and missed for the third time in six attempts.